Dating back to primary school, I can remember looking forward to national holidays for the sole reason that they meant a much anticipated day off from school. As I grew older I began to develop a sense of appreciation for holidays such as MLK Day and Memorial Day and their significance, but outside of always attending our local Memorial Day parade to remember our veterans, I admittedly never really got too involved in any one holiday. While there are many Americans around the country to whom these holidays mean a great deal, I also think that a good portion of the population is much like myself in looking forward to these holidays if only for a day off from work or school. 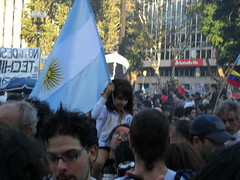 However, here in Argentina, today, the 24th of March, has special meaning for nearly every Argentine, as it marks the anniversery of the military dictatorship’s 1976 coup d’etat of the Argentine state. 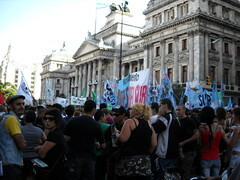 Named Día Nacional de la Memoria por la Verdad y la Justicia, or National Day of Remembrance for Truth and Justice, it stands to remember not only the numerous human rights violations and lives claimed by the various military juntas between 1976 and 1983, but all victims of political oppression in Argentina’s history. The military dictatorship is perhaps best remembered for its brutal treatment of political opposition which imprisoned, tortured, and killed thousands of activists, students, writers, laborers and trade union members. The victims are remembered as ‘desaparecidos‘ or ‘the dissappeared’ because many of the said victims would simply vanish, never heard from again after they were suddenly and silently seized by public officials. Many of the victims were said to have been thrown out of airplanes over the Atlantic Ocean so that no evidence of the dictatorship’s actions could be found. A national comission shortly after the fall of the dictatorship found that at least 9,000 ‘disappeared’, however human rights organizations have placed the number as high as 30,000. 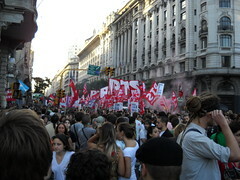 In order to remember this tragedy in Buenos Aires, Argentines flood the streets around the Congress and march to the Plaza de Mayo, where the President’s office resides. While the day has been celebrated since the fall of the dictatorship, it was only in 2002 when the government reconginzed it as a national holiday. 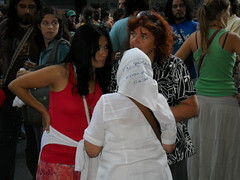 Today, in conjunction with Madres de Plaza de Mayo (a group of mothers of the disappeared who mobilized themselves during the dictatorship and still are active today) and other organizations, the government promotes the holiday and encourages the country to remember all vicitms. In order to see how much this holiday means for the country and the people of Buenos Aires I tagged along with my host brothers to see the city’s yearly tradition of remembering all the victims of the dictatorship. Arriving at the Congressional building, a seemingly endless stream of people were lined down one of the main avenues, carrying huge banners, flags and signs. Organized by political factions and different social groups, organizations from both the left and the right, supporters of the government and detractors, all put aside their political differences and united to remember the tragedy. While my host brothers said that some organizations are there both to remember and also protest current issues, the theme and mood definitely seemed intent on not forgeting the thousands of victims. As the mass moved through the city, songs echoed through the streets, firecrackers occasionally rang out, and space increasingly became scarce as we neared the Plaza de Mayo. Upon entering the plaza, a sea of people flooded the public plaza, lining the steps of the national cathedral, some fortunate enough to be perched on windowsills, the majority clumped together in one massive gathering that included all walks of life and ranged from infant to elderly. 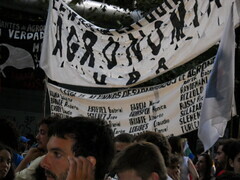 -While there were a multitude of signs, perhaps the one that caught my eye the most was one that had a list of maybe about 50 names of the disappeared that were students of the Universidad de Buenos Aires Agriculture Department. While I’ve only been at UBA for about two weeks, I still felt a small connection with the group. I can’t even imagine living in those times and having classmates, friends, and family suddently disappear from your life without an explanation. While I had read of the aforementioned tragedy and studied some aspects of it in a Spanish literature class last semester, there was nothing quite like being there to get a feel for how the events of the military dictatorship are still remembered by the Argentine community today. It’s hard to get a grasp for the magnitude of a day like today by reading my retelling of a few historical facts and my observations for the day, but I hope my description can bring Argentina’s (at times, tragic) history into a clearer focus for all those following my travels. This entry was posted in Uncategorized and tagged Argentina, Buenos Aires, Desaparecidos, Military Dictatorship, National Holiday. Bookmark the permalink. Very good points about observing the holidays. I am old enough to remember reading about Argentina’s human rights abuses especially the airplanes throwing students and dissidents over the ocean. A few years ago an exArgentinian general was living in Foster City, the city I currently reside in, and an Argentinian women visiting friends spotted him. Her son was a student who was arrested and disappeared. There were a few stories in the paper and enough outrage was generated that activist wanted him tried in a court of law for human rights violations. He subsequently left Foster City to an unknown location. Thanks for sharing your experience and I look forward to your next blog. Interesting. I learned something about Argentina’s history. Maybe you could do a future blog of their (recent) past financial problems and how it affects their economy still.